← Where is summer going? I also put together a memory quilt for someone leaving at work. While in Lancaster I gave dh the assignment of finding some Ladybug fabric to use for the sashing on the blocks and he found some great material. I think she liked it. So, what’s on my cutting table and sewing machine now? 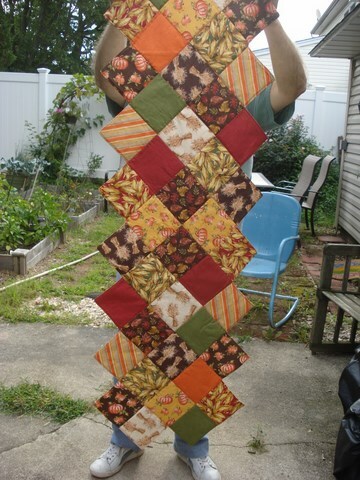 Well, more tablerunners for the November craft fair — there will be Christmas material involved as well as fall. Wine bottle carriers, microwave potato bags, tortilla warmers, probably some mug rugs and ……. well the list goes on and on. So many things running around in my brain. 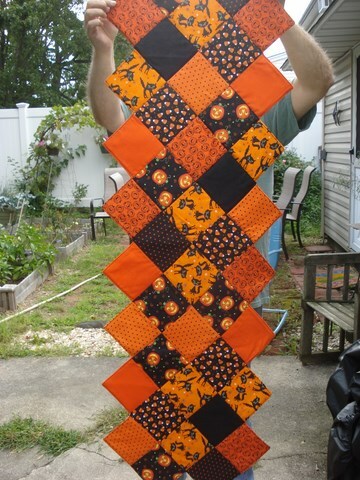 I am also working on two different quilts. Oh, and before I forget — are you ready for some Football?!! It starts tomorrow night and hubby gets to see his Super Bowl Champ Seahawks open the season. Which reminds me, I have some Jets and Giants material in my stash. More ideas popping into my head. Thanks Terry. I was looking at your last sew-along too. My Mom’s name (and grandmother too) was Irene so it caught my eye. I’ve never done a sew-along before so I’m looking forward to it. Thanks for adding me.